After you graduated from the University of Utah—with a BFA in painting and drawing—you continued your education as an apprentice to Utah based artist David Dornan. Could you talk a little about that experience and how an apprenticeship or extended internship differs from today's more common learning methods. My internship with Dave was much more of a direct art education than is generally offered in the traditional university setting. Dave taught me to be a working artist – he supported my technical painting understanding but also emphasized the daily, behind-the-scenes stuff that makes an art career sustainable. Canvas building, framing. Efficiency and really understanding my subject and why I want to paint it. He guided me toward marrying all the knowledge of painting skill with how to run art as a business. It’s been invaluable and I know it shortened my learning curve immensely. You live in Helper, Utah, which has developed a thriving arts community. Can you describe the town and what it’s doing to support and encourage the arts. How does living there inform your work? Helper has always been this awesome, hard-working blue collar town with a vibrant history that extended so much farther back than when the arts community started to settle here. It’s kind of a rebellious place with a coal and mining heritage rather than a pioneer heritage so it’s kind of operated on the fringe of Utah. And I think that is ultimately why the artists sought it out; artists seem to gravitate to being outside the box. We joke that only the strong can survive in Helper and I really think that’s true. Both the historical community and the imported art community give great support to the artists yet it comes with expectation. Expectation that you’re going to work hard and focus on daily improvement. And that’s why I think a thriving art community exists in Helper; people are fierce and dedicated about living here and supporting each other but there’s a cost of admission to truly being a Helper native. I’m still working on that! Your paintings are filled with humorous references to art history and pop culture. Can you describe your process when it comes to coming up with ideas and working them through to a finished piece? Usually the idea leads the process. I come up with a concept and then I work on how to visually bring it to life, taking into account the art history or pop culture style it might reference. My signature is even different from piece to piece because ultimately, I want to shape my skill set to fit the idea rather than the idea bending to my skill set. Tell us about your subject matter, I’m particularly interested in the use of trompe l'oeil when you include coloring books, crayons, paints and “scribbled” marks. The crayons and coloring books started out early in my career as a means to reflect on art history in a unique way. And of course, I was taught in a realist school. So, I had to learn to make a crayon look like a crayon and a swipe of paint look like a crayon made it. I think art with illusion or trompe l'oeil really has the ability to draw us in, the same way a good storyteller or magician gets us lost in the process. And there’s also just a basic satisfaction I get from making a crayon look round or a page look like it’s folding up at the corners. Art is just so fundamental to the life and learning process – I’ve realized that even more so, watching my own kids. So, to make art about art is extra engaging to me. If you were hosting a dinner party for five people you admire but haven't met—living or dead—who would they be and why? Vermeer – Best painter of all time. Banksy – Out of any current artist, I’d most like to pick his brain. Christopher Harris – Fantasy football expert (my favorite non-art pastime) and novelist. Great thinker. Quentin Tarantino – Pulp Fiction was the right movie at the right time for me. Love his innovation and reimagination of genre. I’m passionate about good film. Tell us a little about your upcoming show and the inspiration behind it. 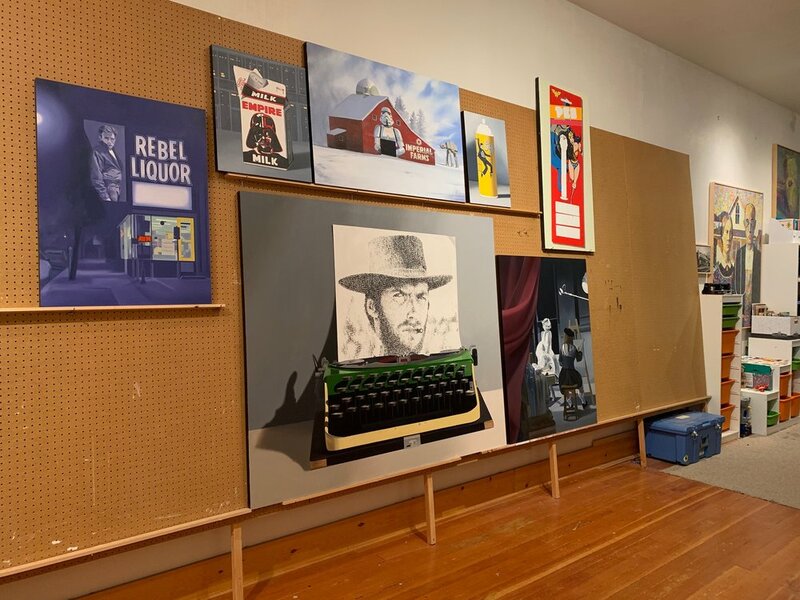 The pieces will reference everything from “Star Wars” barns and milk cartons, Vermeer painting Marilyn Monroe, a giant typewriter typing up Clint Eastwood, Elvis spray paint, a “Wonder Woman” Pez head, an Art World meets “The Matrix” parody, and “A Rebel Without a Cause” liquor store. I’m really looking forward to a fun and dynamic exhibit.